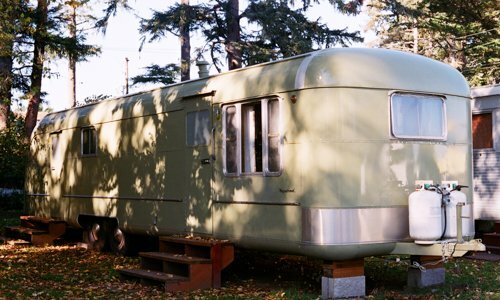 We have a fleet of over 20 renovated Vintage Travel Trailers from the 1950’s and 60’s. 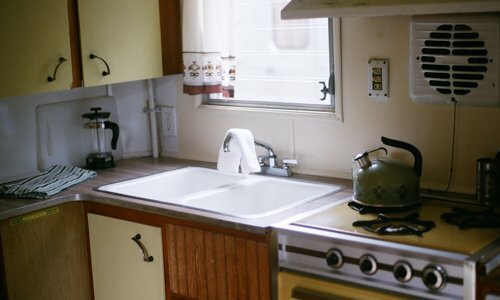 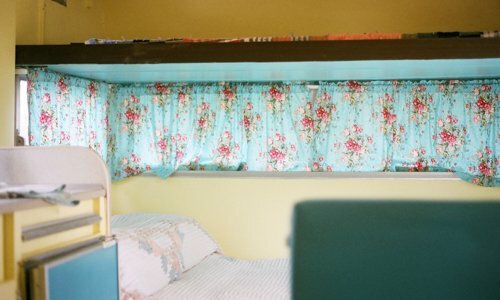 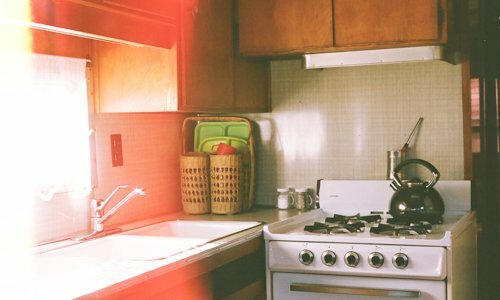 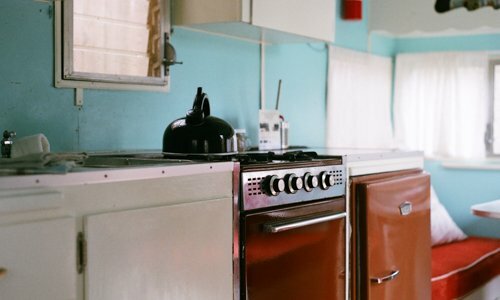 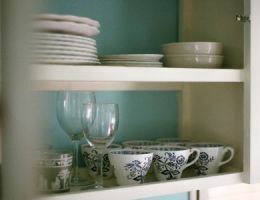 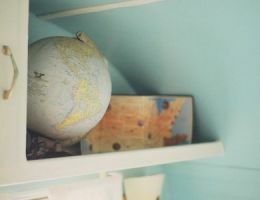 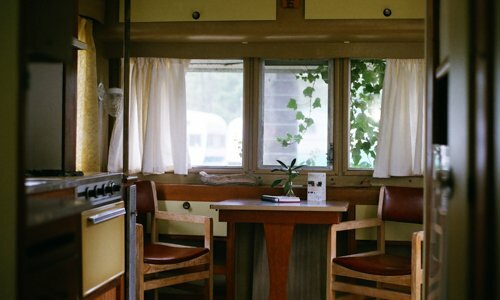 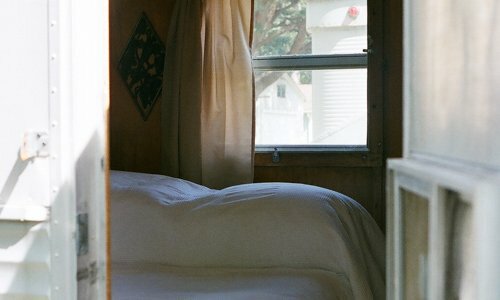 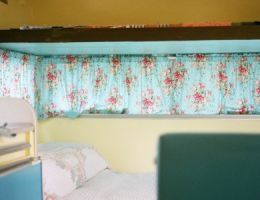 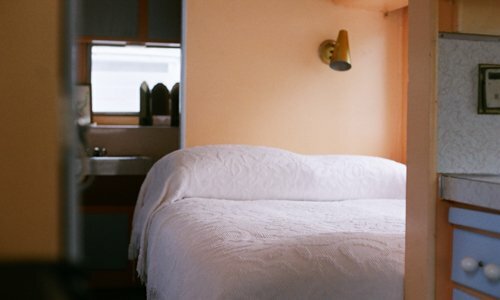 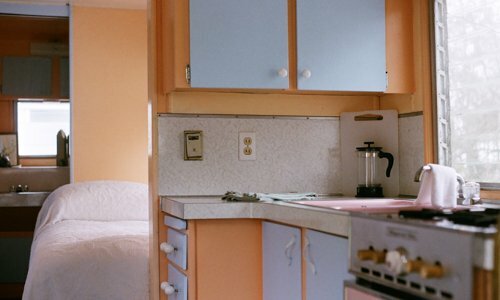 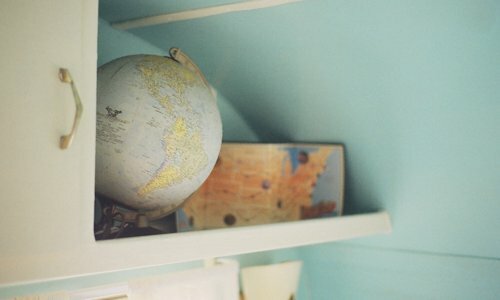 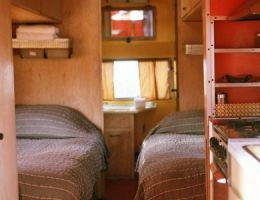 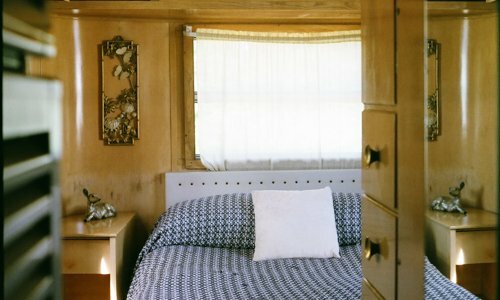 They vary in size from 16′ up to 40′ long with amenities ranging from simple & rustic to fully-equipped, each with their own unique aesthetic and vintage appeal. 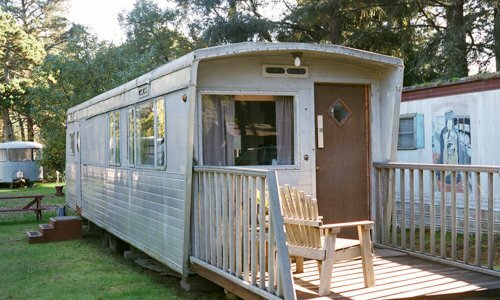 We classify our trailers in 5 types Rustic, Baby, Standard Park Model, Family and Deluxe. 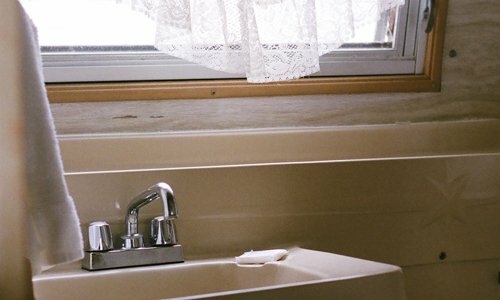 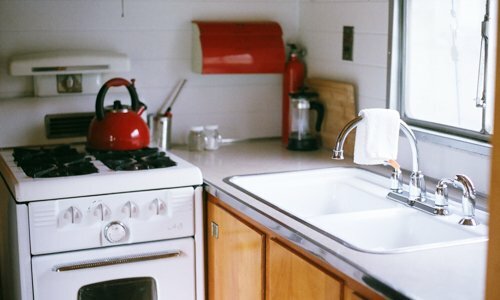 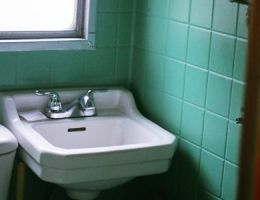 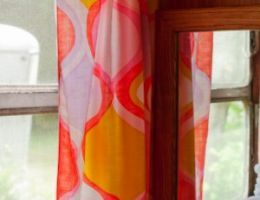 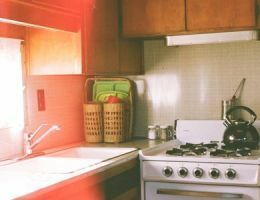 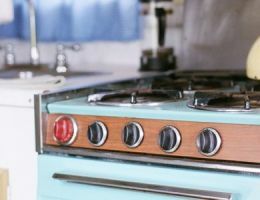 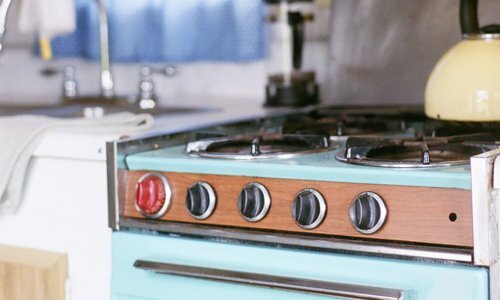 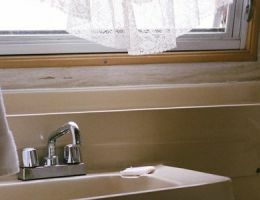 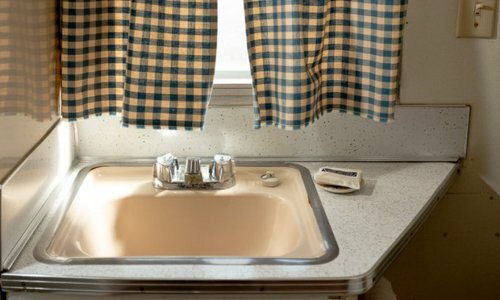 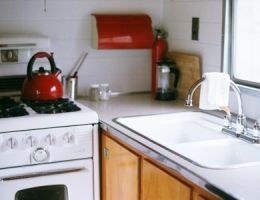 A simple, inexpensive way to stay with all the basics: water, electricity and heat. 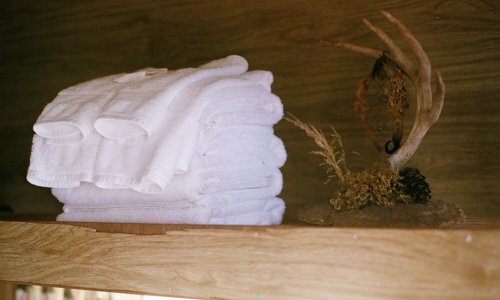 Guests are welcome to use any of our three heated, private/public bathrooms & showers in the nearby pavilion. 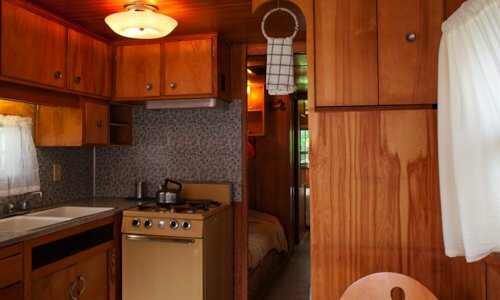 The 1950’s Shasta is an absolute delight for one person. 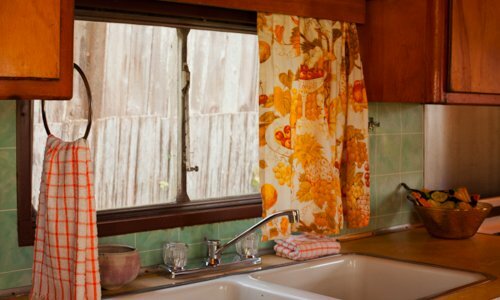 It is part of our Rustic collection and has all the basics: water, electricity and heat. 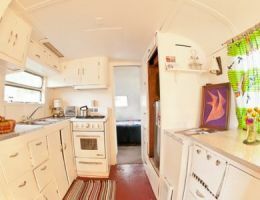 This cozy private pod has a simple stove top for cooking and original bench-style seating nook surrounded by windows. 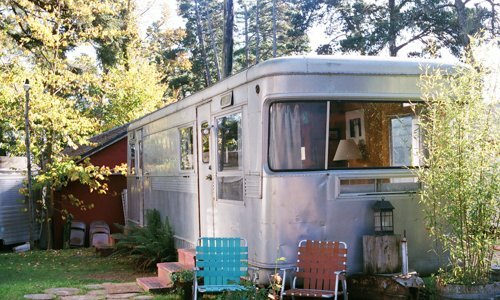 A great getaway for people who appreciate minimal and intimate. 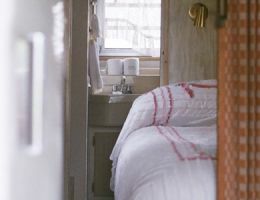 Guests staying in this accommodation are welcome to use any of our three heated, private/public bathroom & showers in the nearby pavilion. 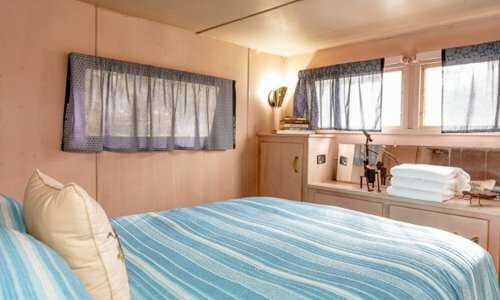 The Deer Camper is part of our Rustic Trailer collection, which makes for a simple, inexpensive stay. 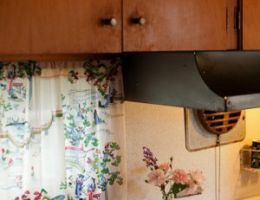 It is hunting themed and has all the basics: water, electricity and heat. 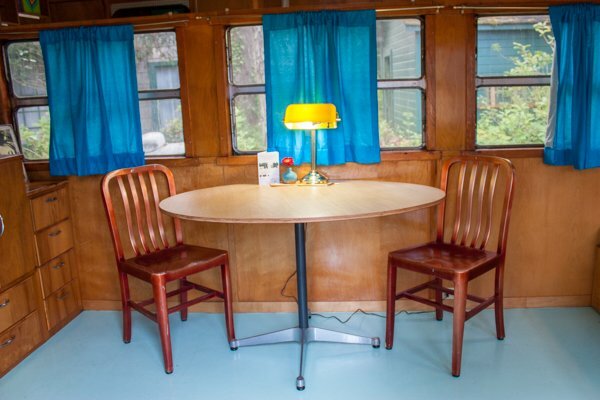 It’s original booth style dining seating is great for playing games and eating-in. 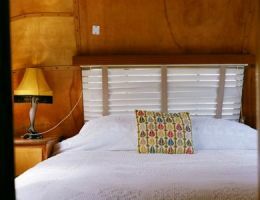 Guests staying in this accommodation are welcome to use any of our three heated, private/public bathrooms & showers in the nearby pavilion. 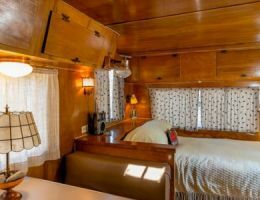 The Buena Vista is a beautiful 1947 single axle Spartan. 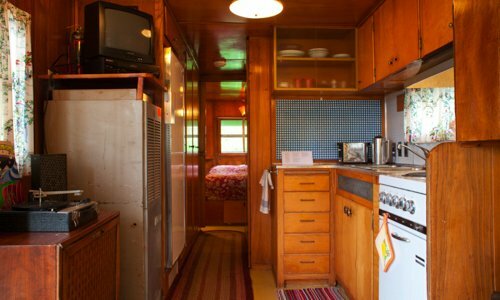 It has a spacious seating nook, a kitchen equipped with cold running water and an electric hotplate. 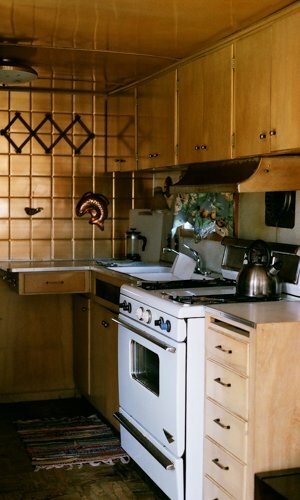 Minimalist environmental art by artist and musician Corrina Repp. 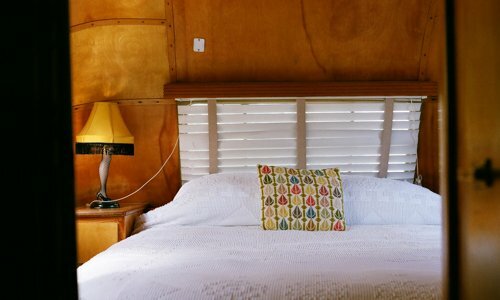 Guests staying in this accommodation are welcome to use any of our three heated, private/public bathroom & showers in the nearby pavilion. 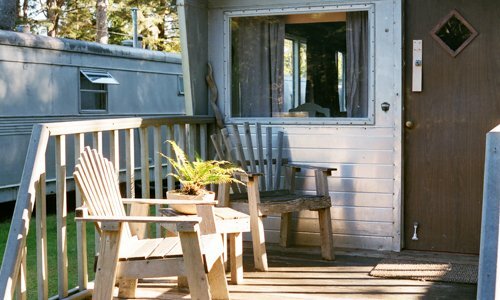 Everything you need for a quaint and cozy beachside getaway. 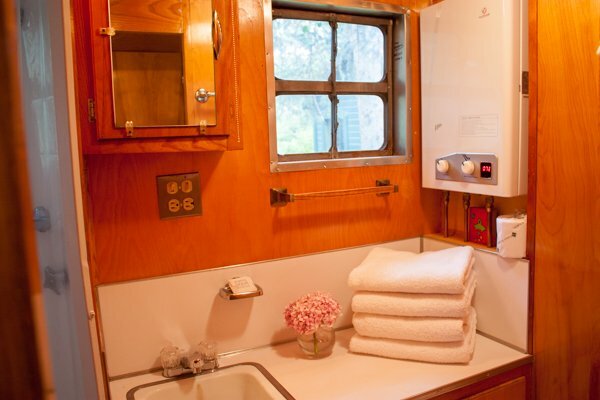 These trailers have a kitchenette, bathroom (some with showers), and a small sitting area. 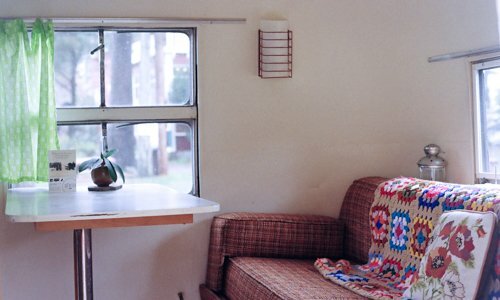 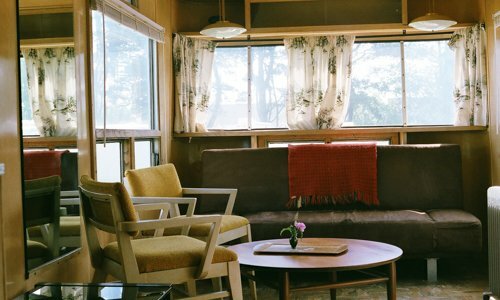 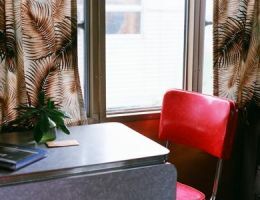 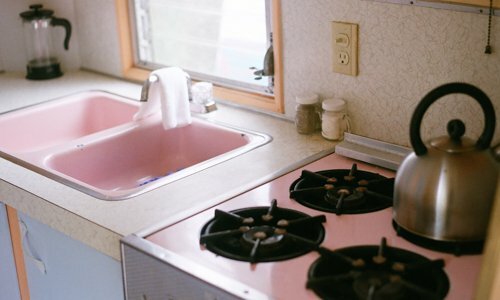 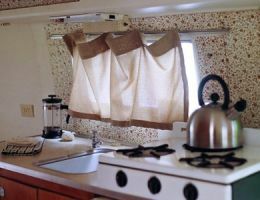 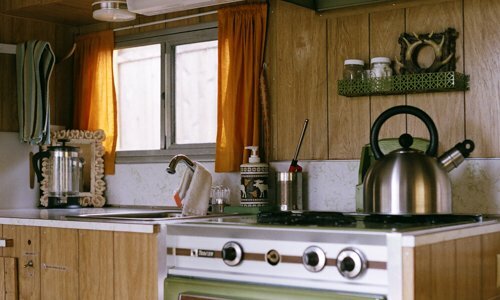 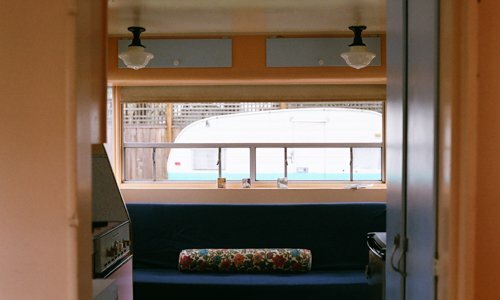 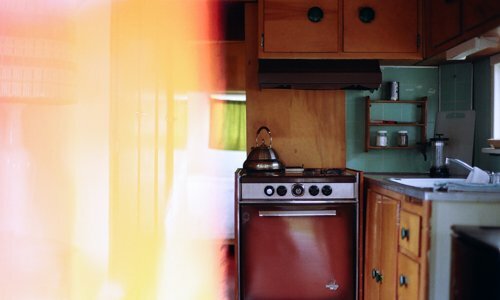 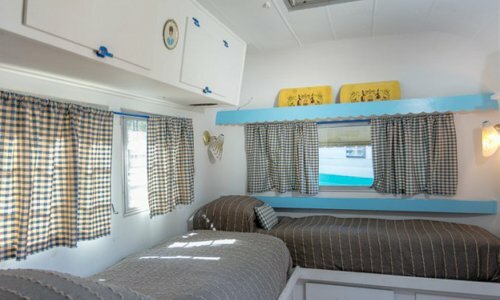 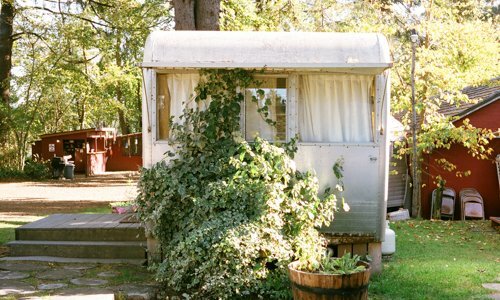 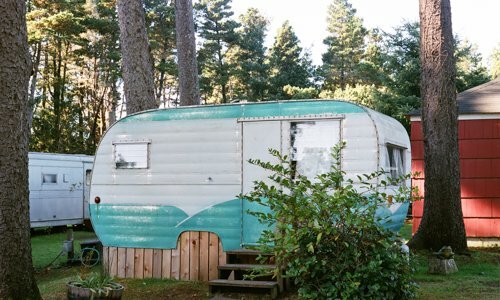 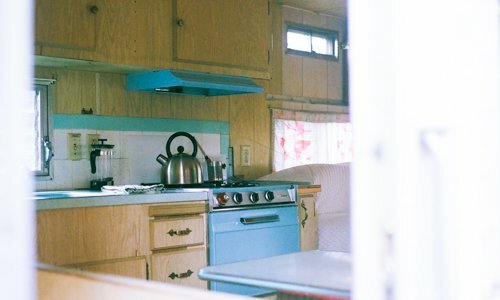 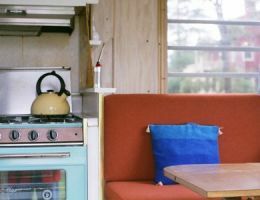 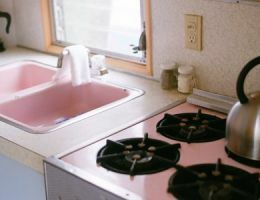 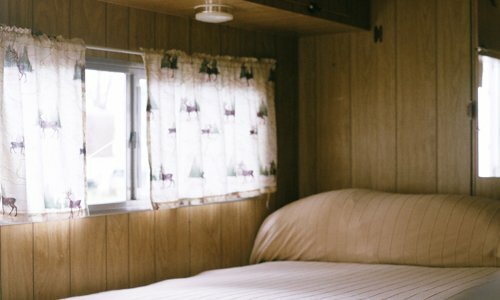 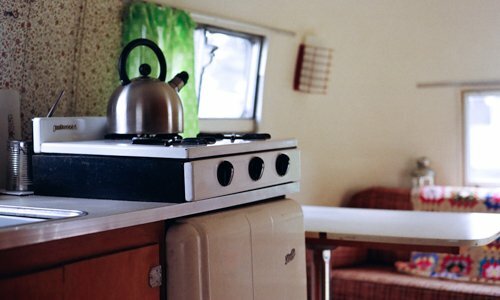 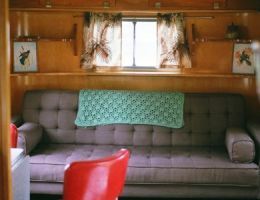 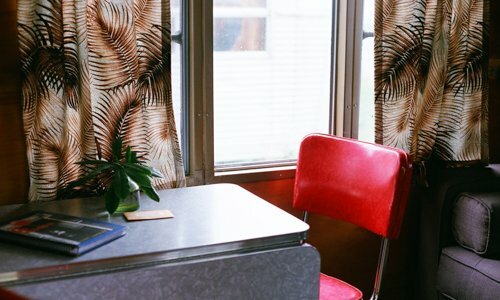 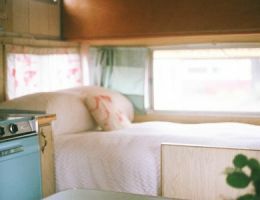 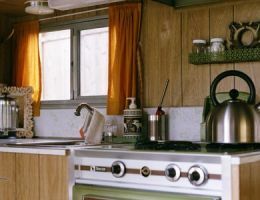 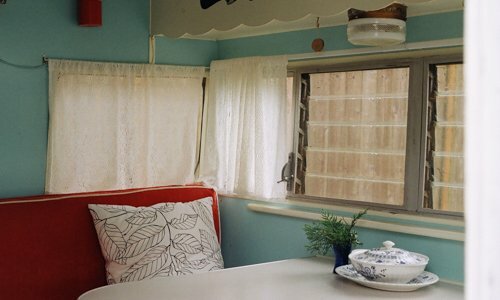 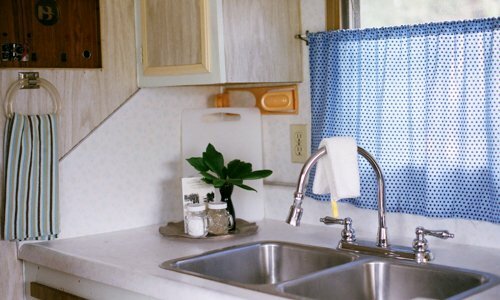 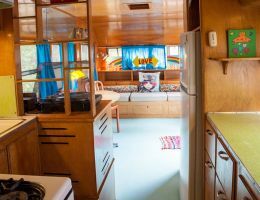 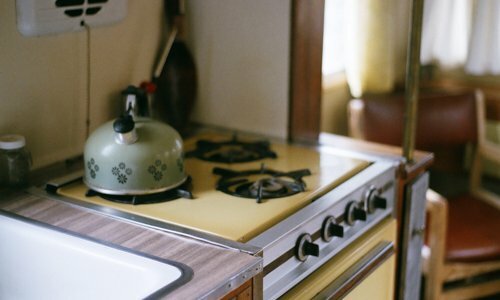 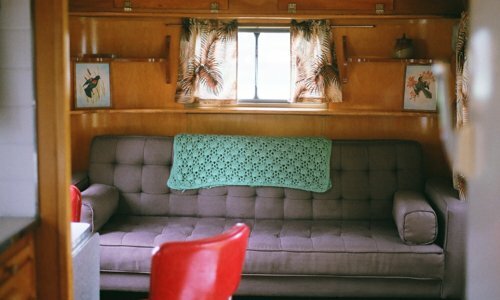 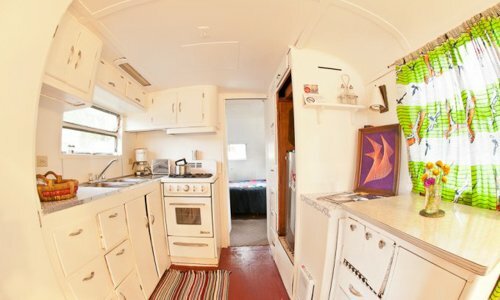 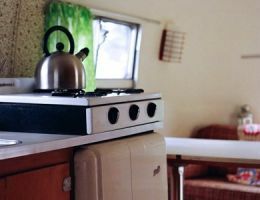 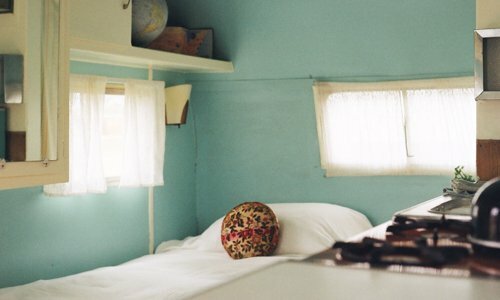 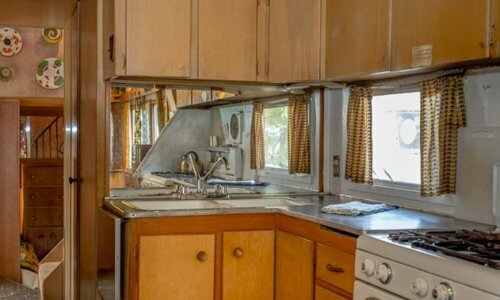 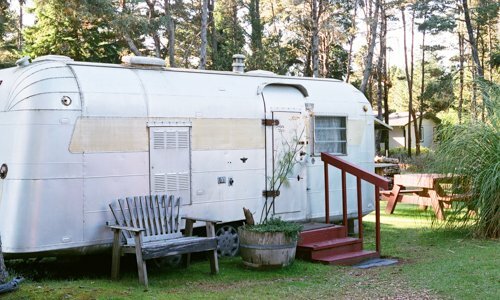 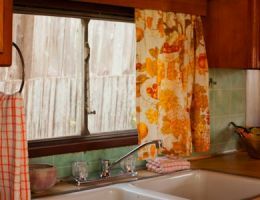 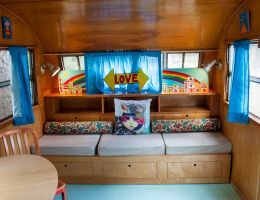 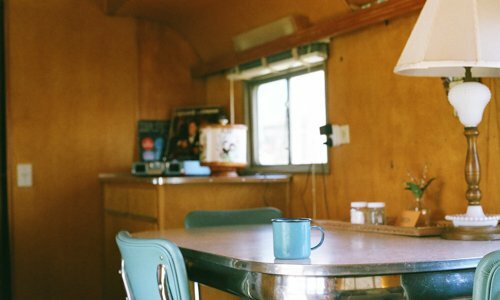 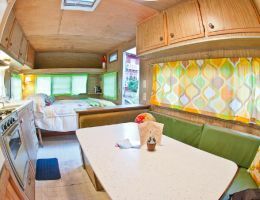 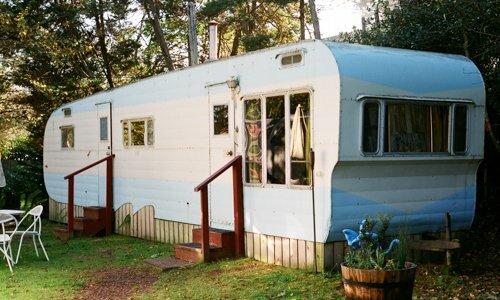 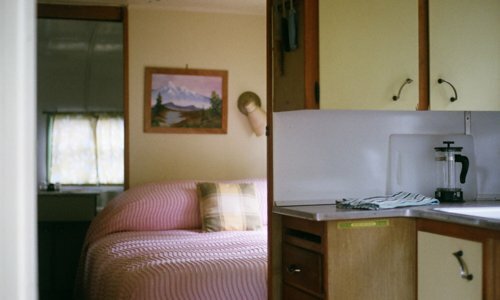 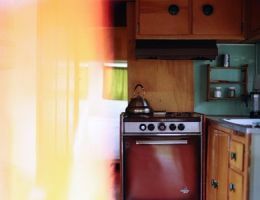 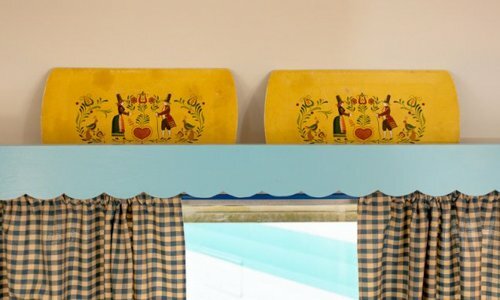 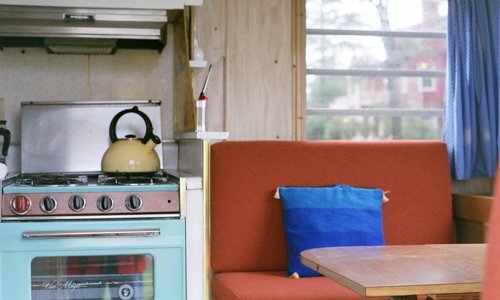 The Arrowhead is a super cute 1960’s Vintage Travel Trailer. 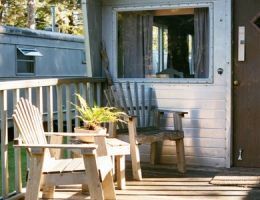 It is the most popular of our Rustic Trailer collection with everything you need for a quaint and cozy beachside getaway. 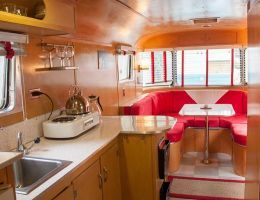 It has booth style seating which makes for a sweet space to hang and play games. 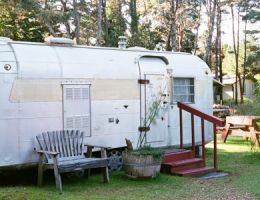 It is conveniently located in the inner trailer court just outside the main Lodge, picnic tables, and fire pits. 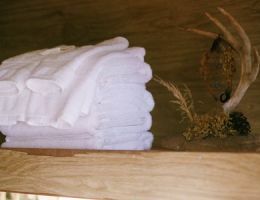 Guests staying in this accommodation are welcome to use any of our three heated, private/public showers in the nearby pavilion. 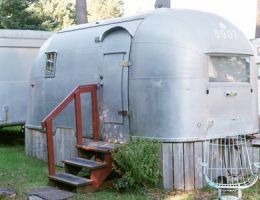 The Potato Bug is a 1953 Airstream Wanderer with a full-sized bed. 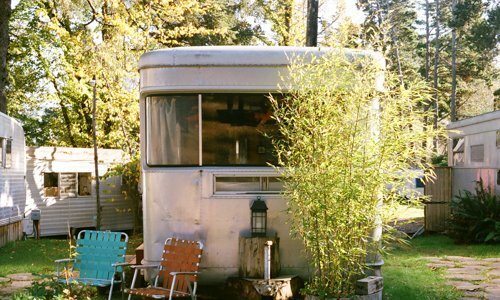 This curved, arch-shaped trailer is one of our coziest among the Baby Trailer collection. 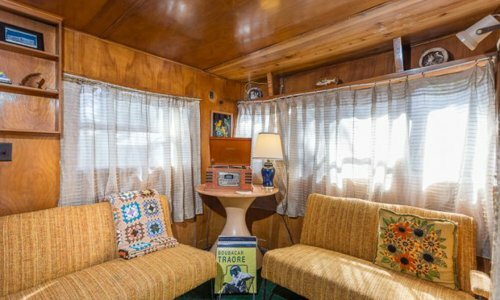 It has a leather sofa and floral wallpaper! 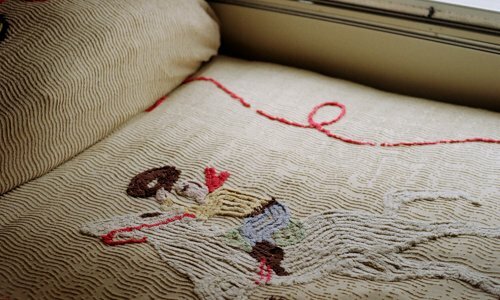 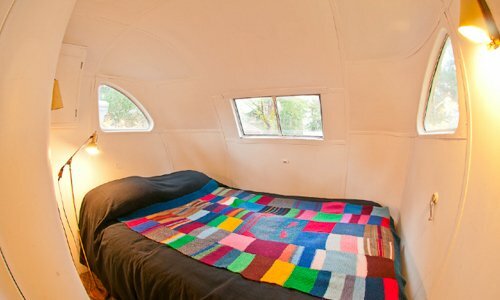 You’ll be snug as a bug. 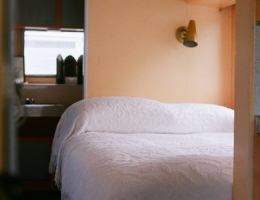 Guests staying in this accommodation are welcome to use any of our three heated, private/public showers in the nearby pavilion. 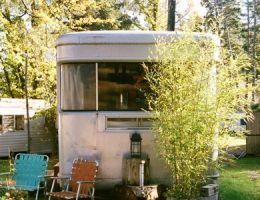 The Boles Aero is a cute 1953 Vintage Travel Trailer. 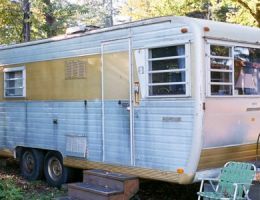 This baby trailer has a small wooden deck/platform and a dining area great for eating-in or playing games. 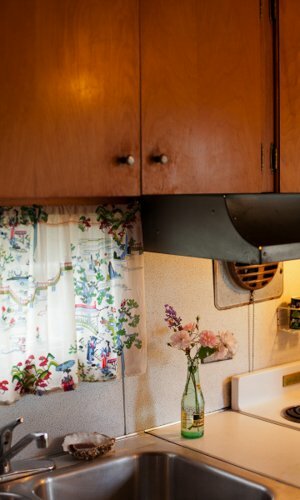 The trailer is west facing, has beautiful natural light, and is centrally located to all our amenities. 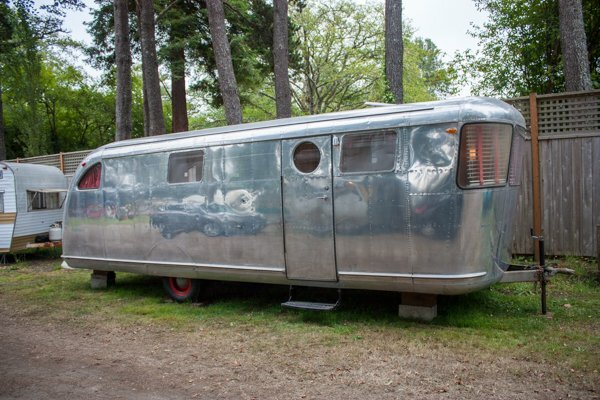 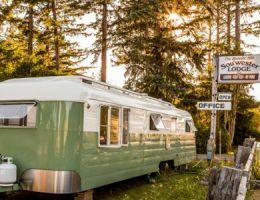 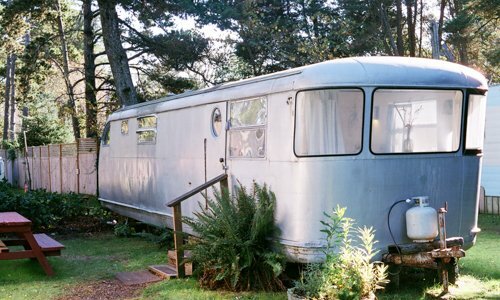 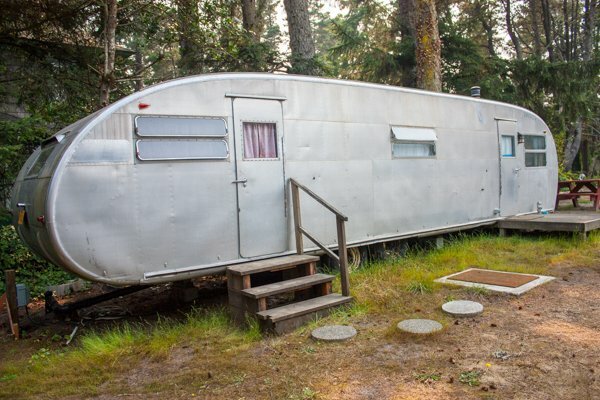 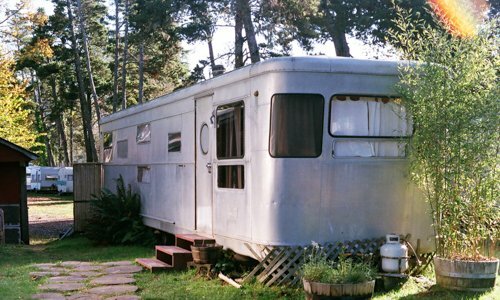 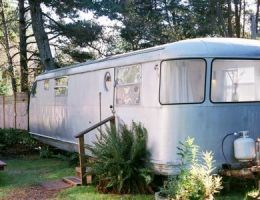 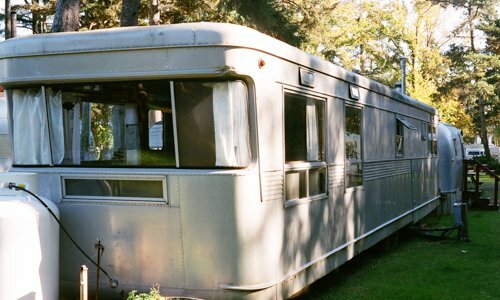 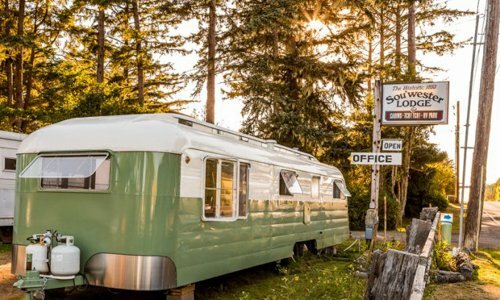 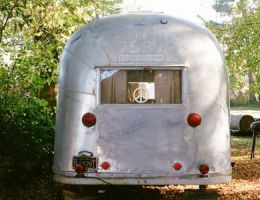 The Silver Streak is a charming 1953 Vintage Travel Trailer. 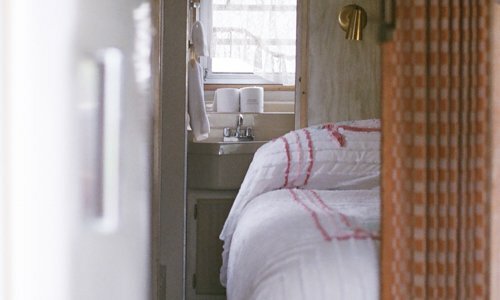 The two twin beds in an L-shape make this cute and cozy trailer perfect for two single folks. 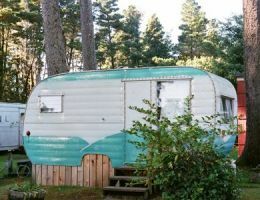 This trailer is west facing, has beautiful natural light, and is centrally located to all our amenities. 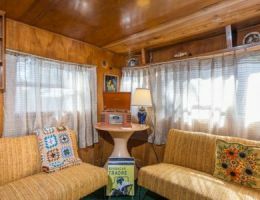 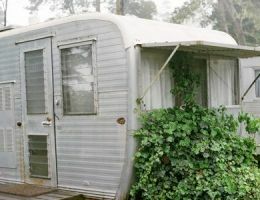 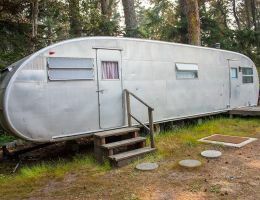 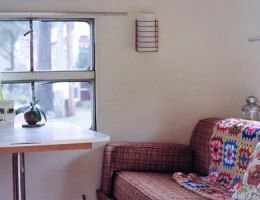 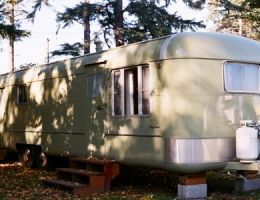 The Estrallita (“Tiny Star”) is a 1953 Boles Aero Travel Trailer. 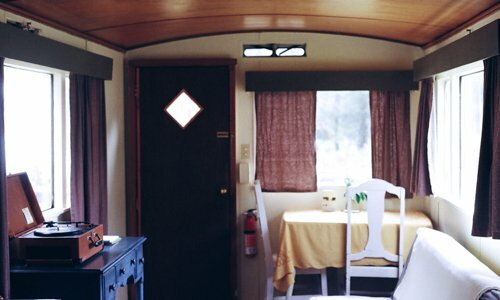 It is one of the most spacious in our Baby collection. 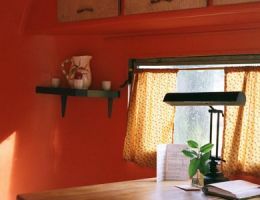 The warm peach wall color gives it a southwest, desert vibe. 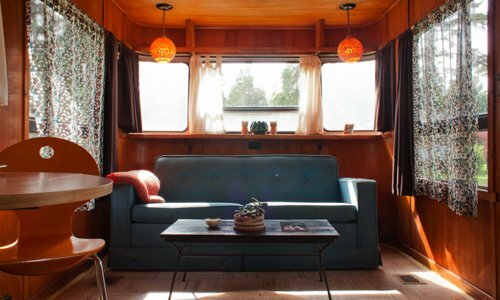 A sweet and romantic space for two. 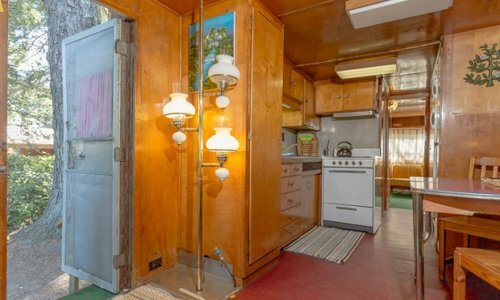 This unit has a full-size fold down couch that is appropriate youth. 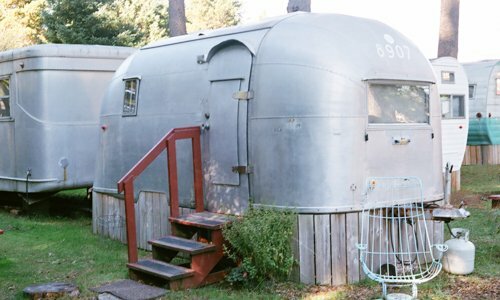 The Moroccan is a 1969 Boles Aero Travel Trailer part of our Baby collection. 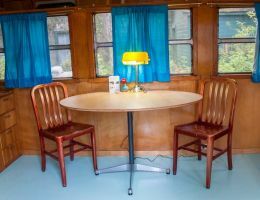 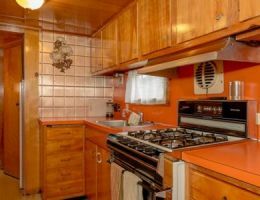 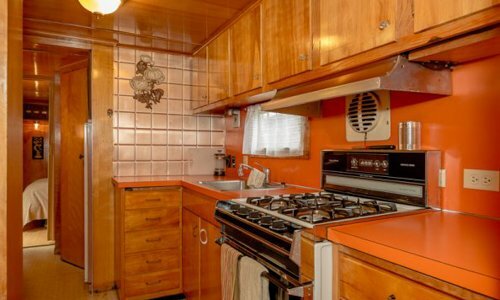 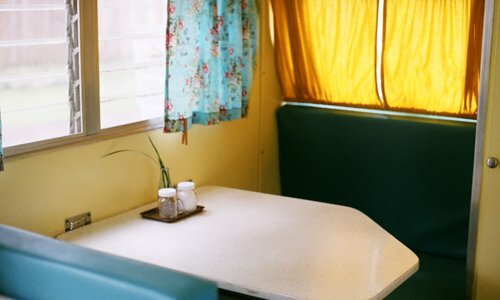 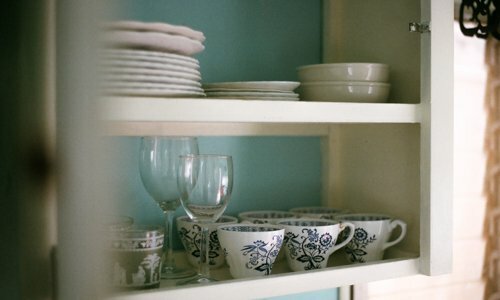 It has a beautiful bright blue, original kitchen stove and booth seating. 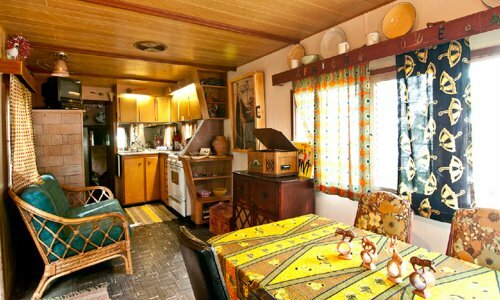 The details in this space are truly one of kind and make the Moroccan live up to its name. 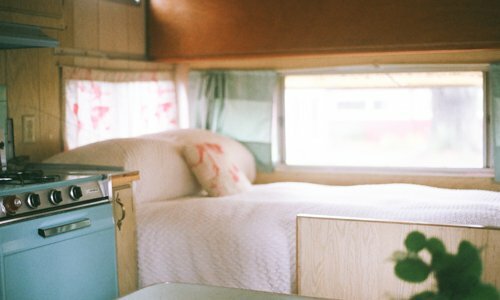 A sweet and romantic space for two. 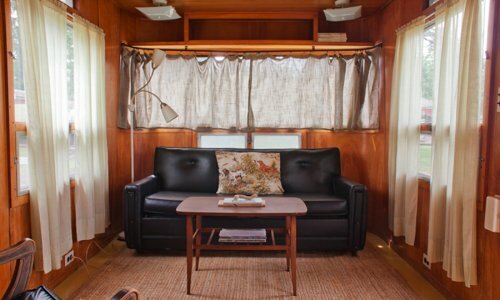 The Aristocrat is part of our Rustic Trailer collection, which makes for a simple, inexpensive stay. 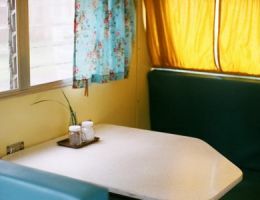 It has its original turquoise kitchen with booth seating area with table. 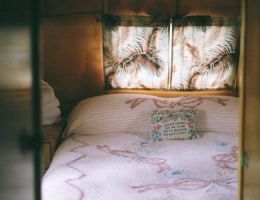 Guests staying in this accommodation are welcome to use any of our three heated, private/public showers in the nearby pavilion. 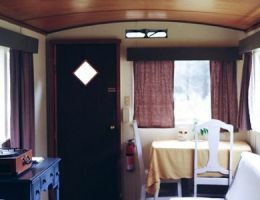 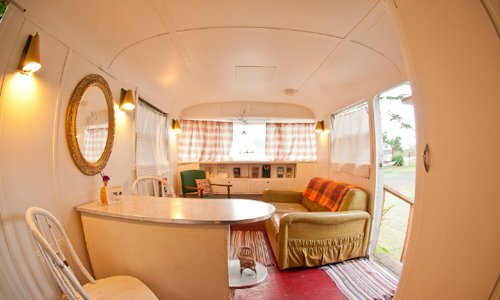 The Fireball is a cute and cozy 1953 Vintage Travel Trailer. 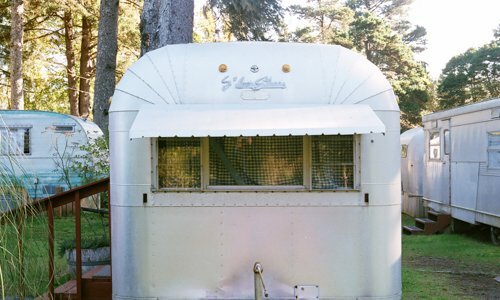 It’s one of our most private of the Baby Trailer collection, nestled among the trees next the main Lodge. 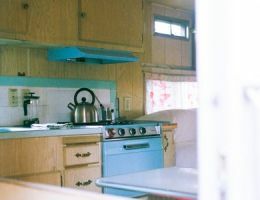 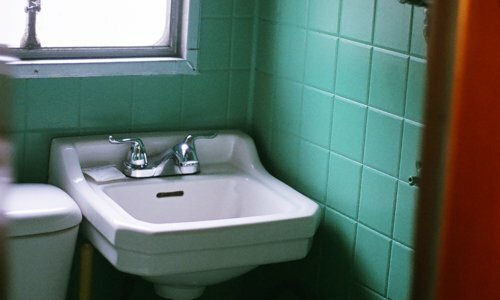 It has bench style booth seating and original turquoise vintage sink/stovetop. 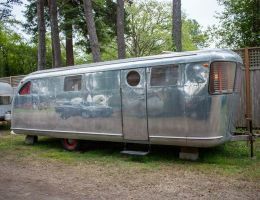 The Airstream is an authentic 1950’s Vintage Travel Trailer and is part of our Baby Trailer collection. 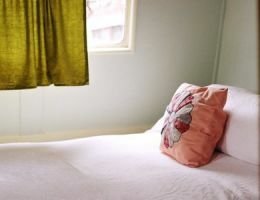 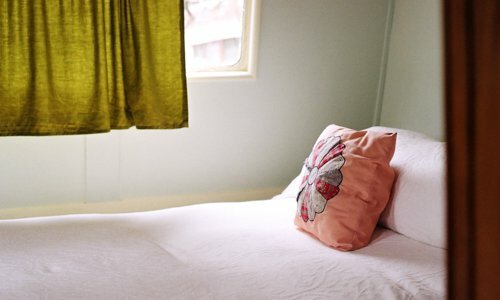 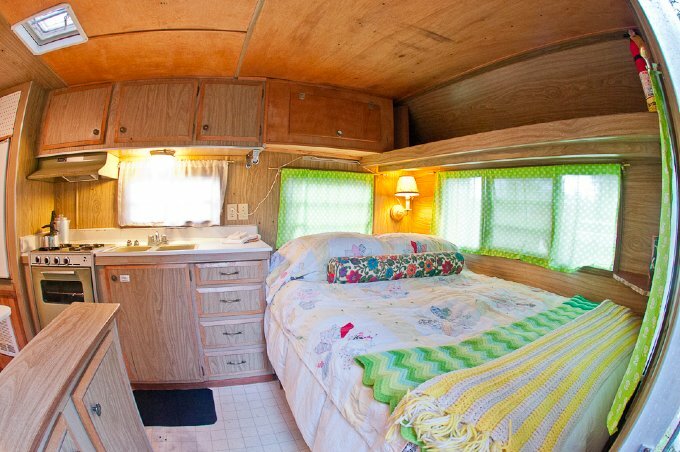 This cute, cozy space has two twin-sized beds, making it perfect for two single folks. 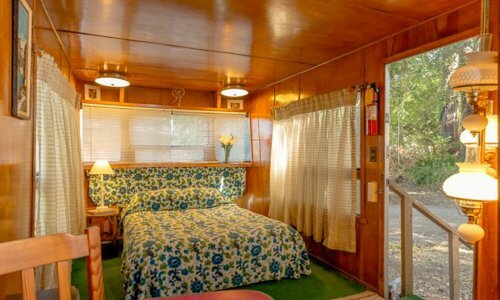 Located in a sweet cove under the trees, this trailer has a sense of privacy. 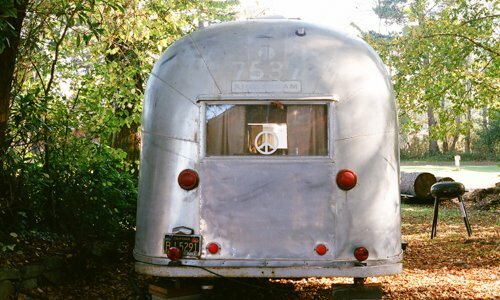 Also, the signature, noteworthy peace sign on the rear window is one of our most photographed details! 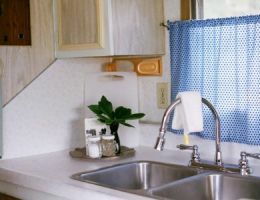 These full size models deliver a spacious trailer-stay with all the luxuries of a studio apartment: a private bedroom, kitchenette, living area, and bathroom. 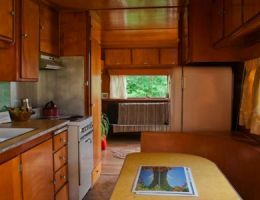 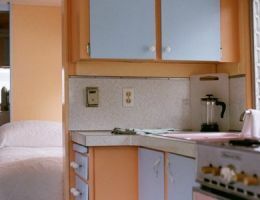 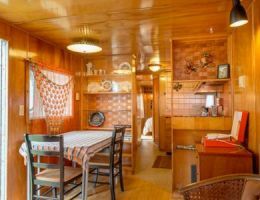 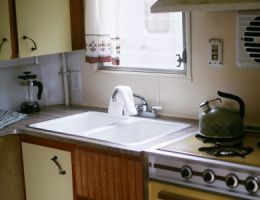 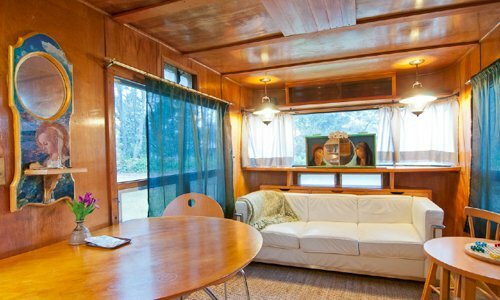 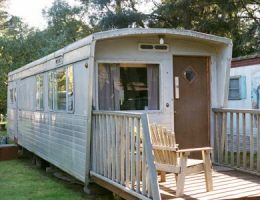 The Spartan Manor is a standard-sized 1953 Spartan with a roomy feel. 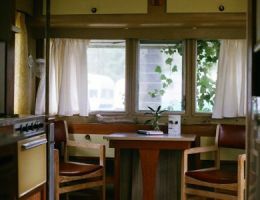 It is the most classic among our Park Model collection. 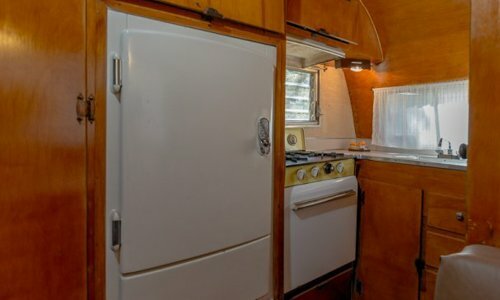 It has an open layout, making it great for hanging out. 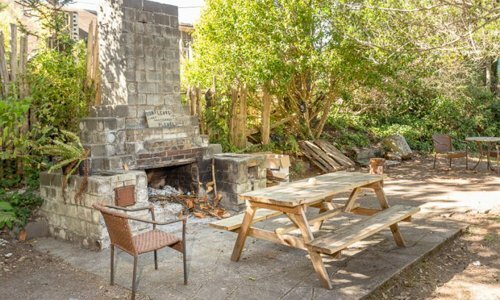 It is west facing and conveniently located in the inner trailer court adjacent to the main Lodge, picnic tables, and fire pits. 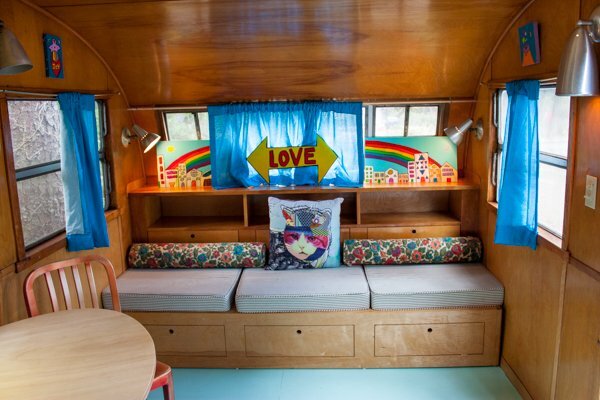 This unit has a full-size fold down couch that is appropriate for youth. 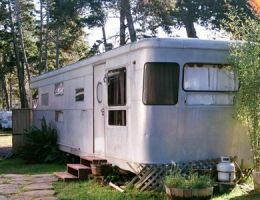 The Old Spartan coined its’ name because it was our very first trailer! 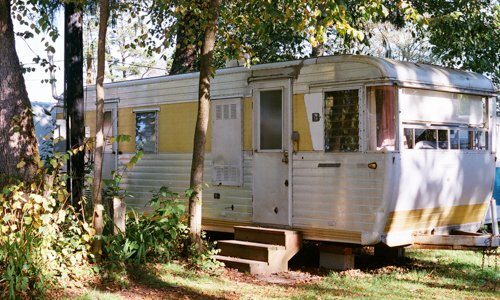 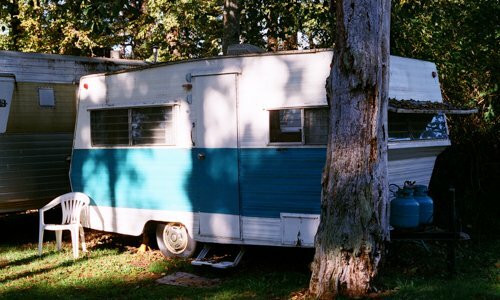 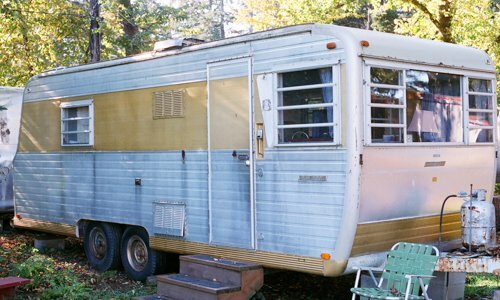 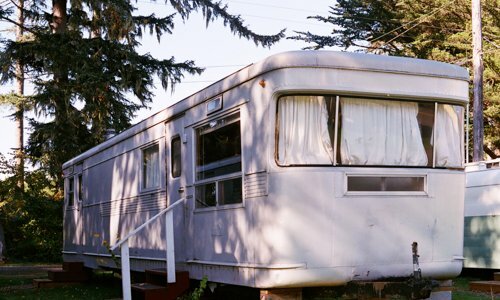 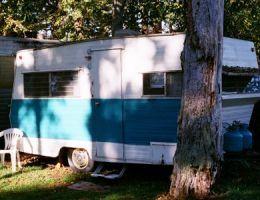 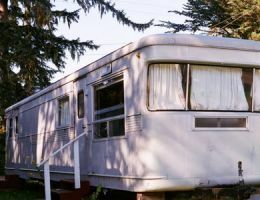 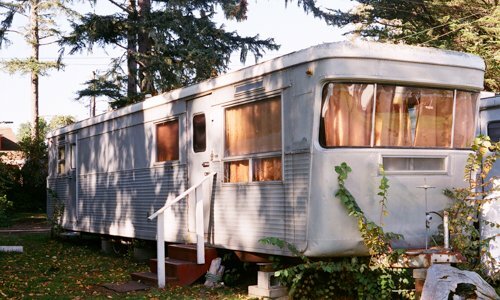 This standard-sized 1953 Park Model later became the original Artist Residency Trailer. 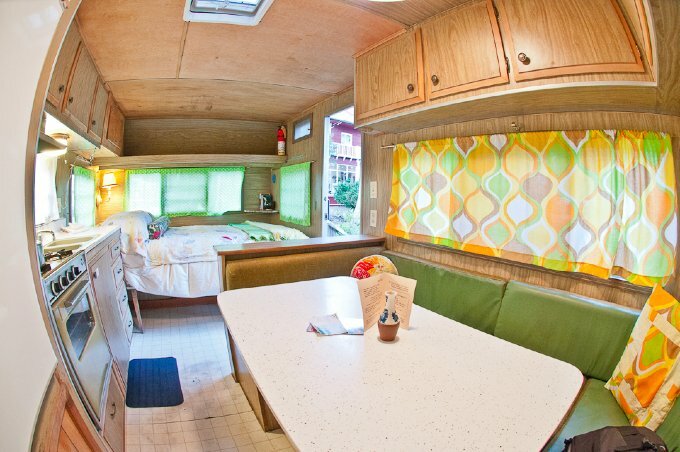 With white walls and a minimalistic aesthetic, this trailer has a bright airy feel. 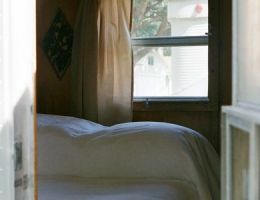 It is west facing with beautiful afternoon light and conveniently located in the inner trailer court by the main Lodge, picnic tables, and fire pits. 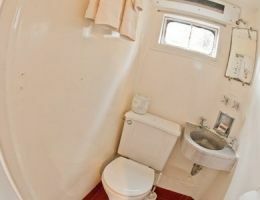 Guests staying in this accommodation are welcome to use any of our three heated, private/public showers in the nearby pavilion. 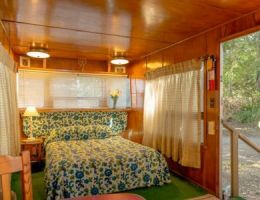 The Zelmar Cruiser is a standard-sized 1953 Vintage Travel Trailer part of our Park Model collection. 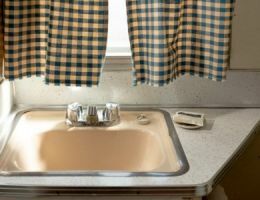 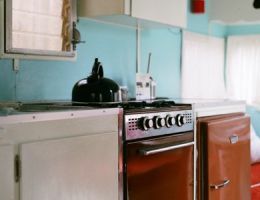 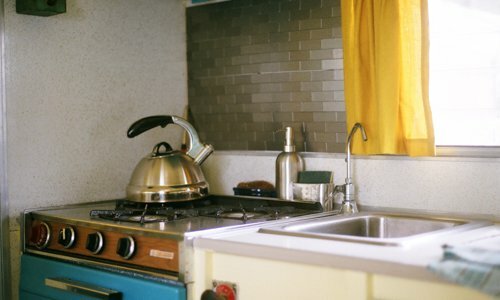 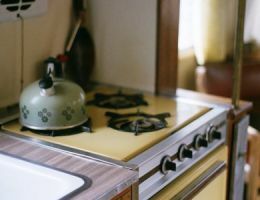 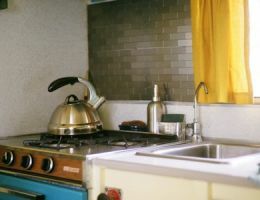 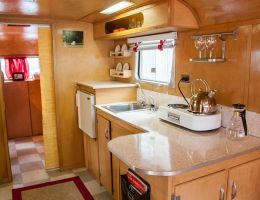 Its highlight is the kitchen with yellow countertops & a Formica table with built-in bench seating and retro-style curved walls. 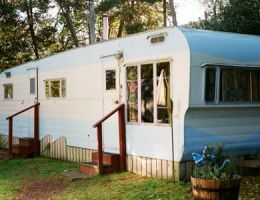 The white and light blue exterior paint highlights the trailers wave-pattern edge, making this one of our most photographed trailers. 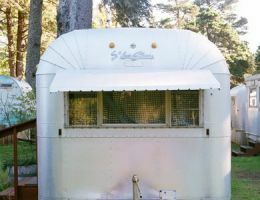 The Picnic Trailer is a standard-sized 1953 Vintage Travel Trailer. 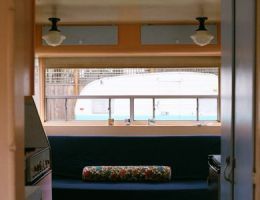 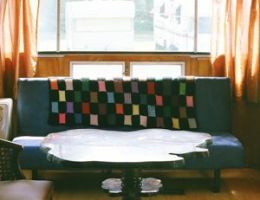 The highlight of the space is the music lounge with two love seats, a record player, 2 speakers and a full array of vinyl. 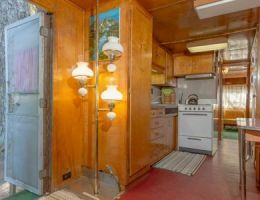 In alignment with this trailer’s picnic theme, the back door leads out to a wooded picnic area and outdoor stone fireplace (shared with the adjacent tent site). 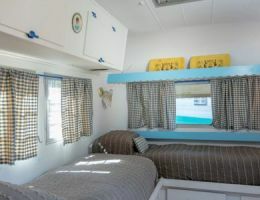 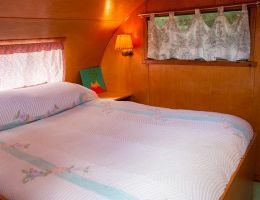 Most of the bedrooms in our trailers are located in the back, but this one features a bed located at the front, atop a carpet of astro-turf, picnic trailer style! 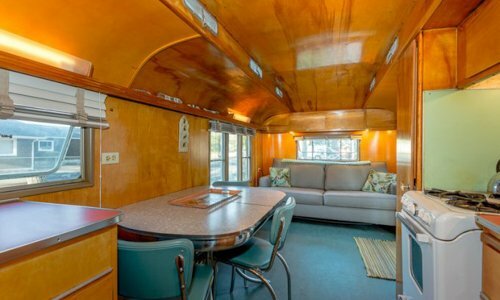 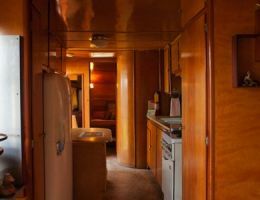 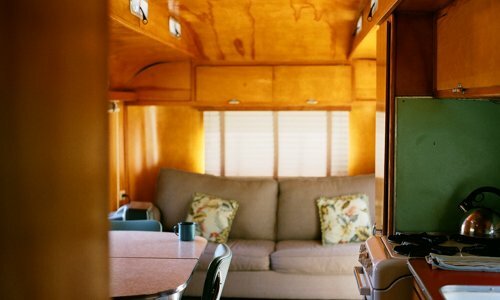 The Earl is a super spacious, standard-sized 1957 Vintage Travel Trailer. 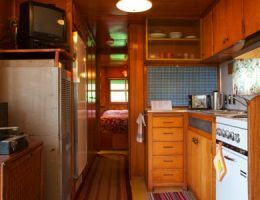 It’s high ceilings (for a trailer that is) makes it great for hanging out with a small group, having meals, and playing games. 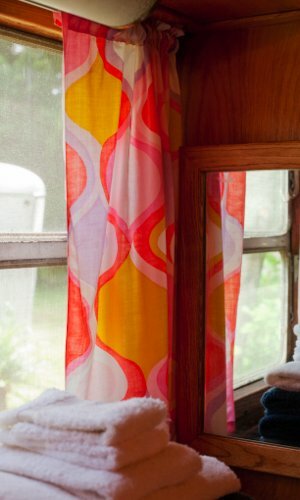 Among one of our faves, it has tasteful, kitschy flare and a romantic appeal. 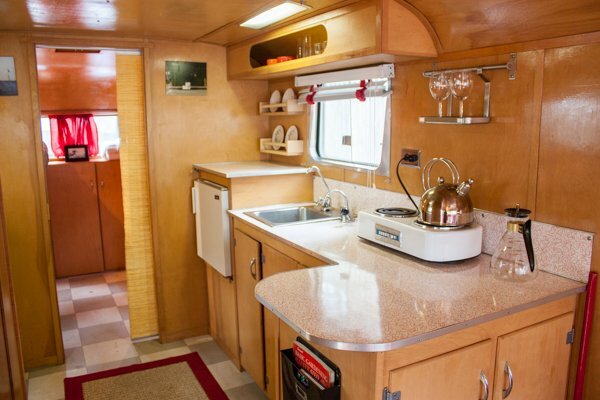 The Jet is a spacious, standard-sized 1953 Vintage Travel Trailer. 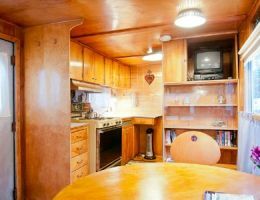 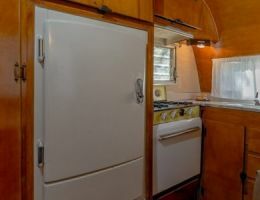 Its high ceilings (for a trailer that is) makes it great for hanging out with a small group, having meals, and playing games. 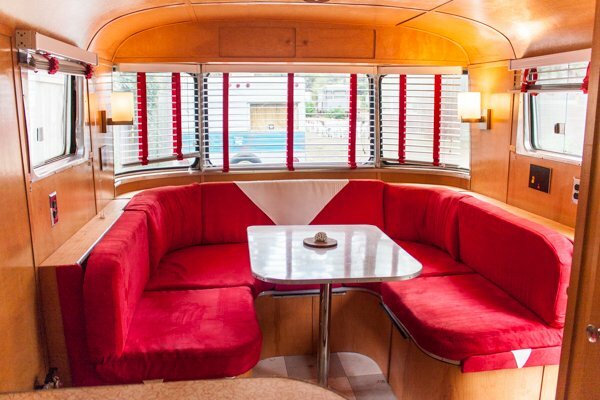 Much like the Earl, it has tasteful, kitschy flare and a sultry vibe. 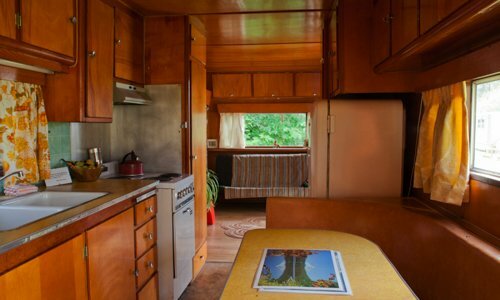 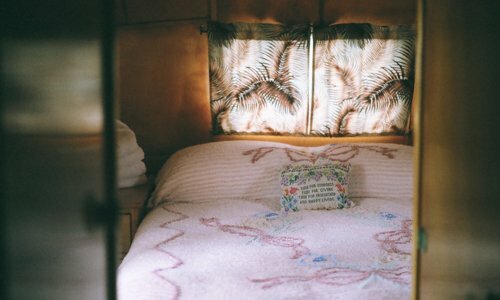 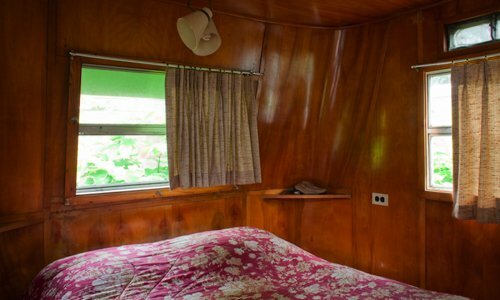 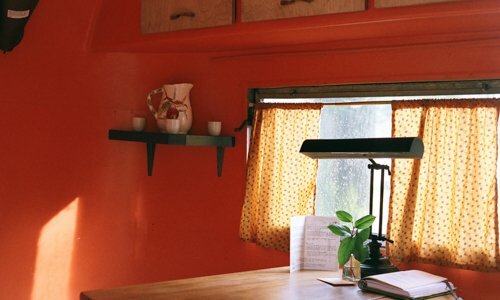 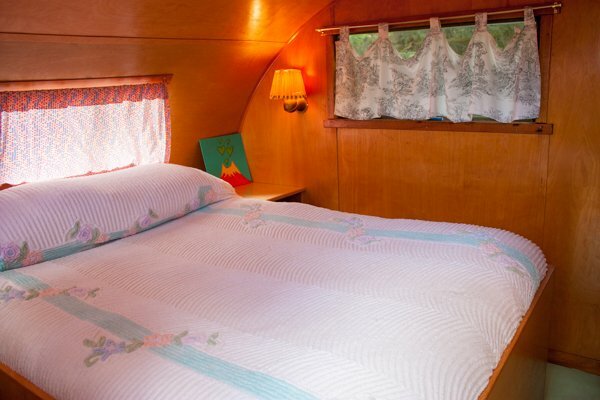 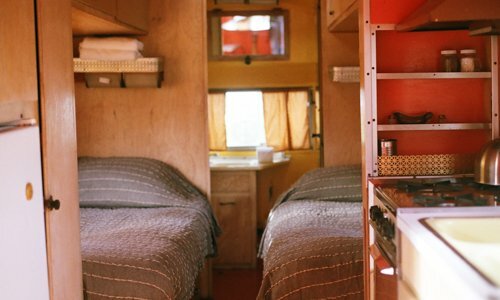 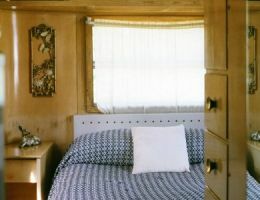 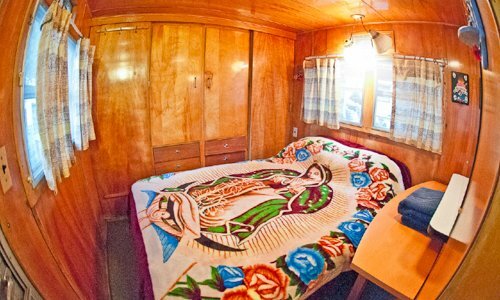 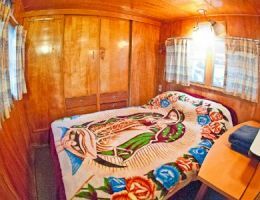 The Prairie Schooner is a recently renovated standard-sized 1953 Vintage Travel Trailer. 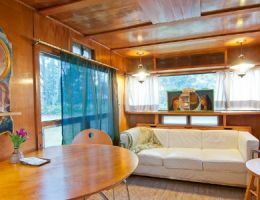 The spacious living room has a lot of windows with great natural light and a writing desk. 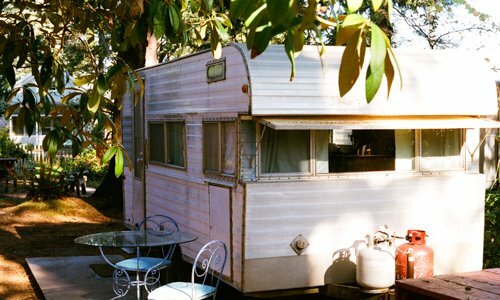 It’s one of the only trailers with front porch, which faces west for epic sunset lighting. 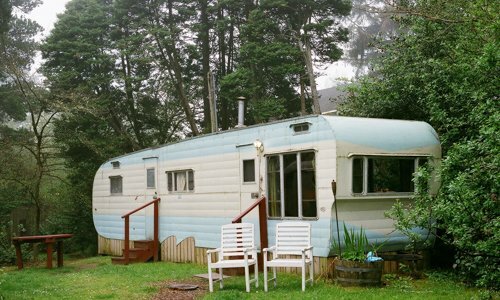 It sits quietly off the beaten path for a private feel. 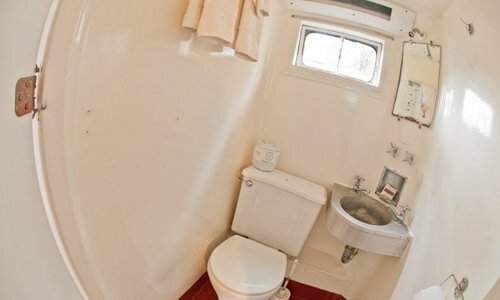 Guests staying in this accommodation are welcome to use any of our three heated, private/public showers in the nearby pavilion. 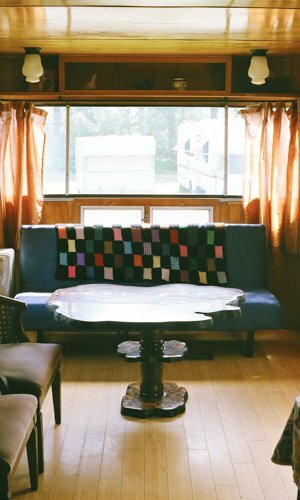 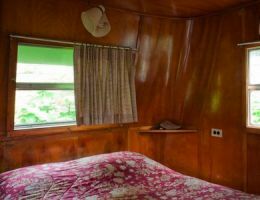 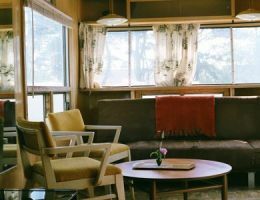 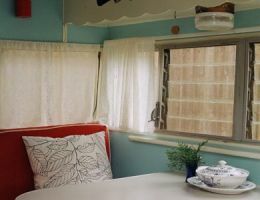 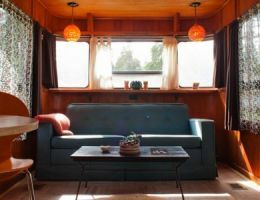 The Westcraft is a standard-sized, beautifully refurbished 1952 Vintage Travel Trailer located by our street-side garden. 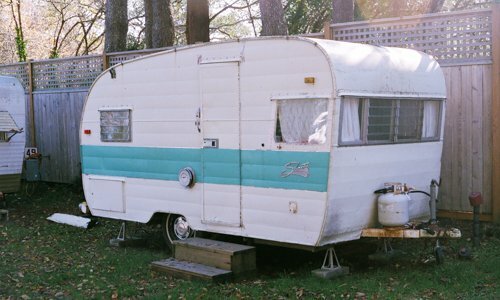 There are only two known of its kind, so it truly is a rare gem! 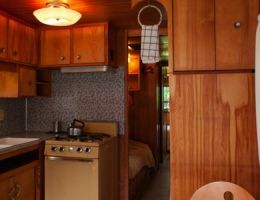 The interior has a remarkable wood finish fused with retro décor, giving it a fresh and classic feel. 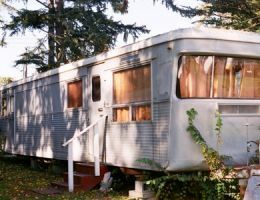 The JC Penny named after the former manufactured home that once stood in its place, is a stylish 1952 Spartanette privately situated on the SW corner of our grounds. 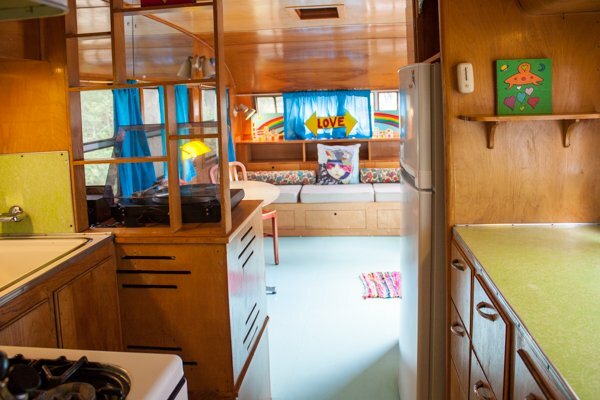 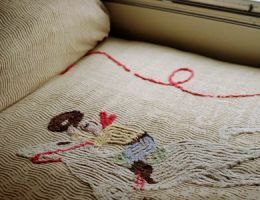 It showcases the art of Larry yes and lots of vintage flair. 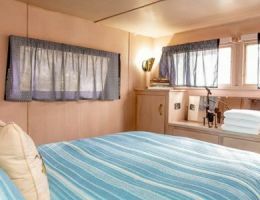 These full size trailers give guests a spacious trailer-stay with room for the whole family. 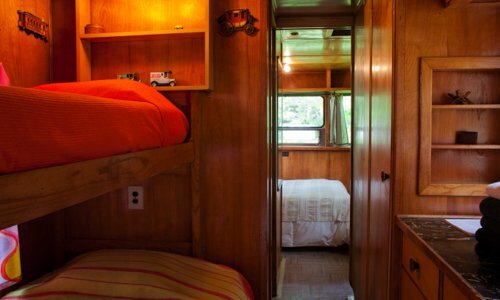 They’re also great for friends that want to bunk-up together. 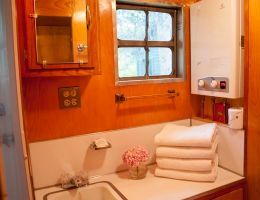 They have a private bedroom in the back bedroom, twin bunks, a kitchenette, living area, and bathroom. 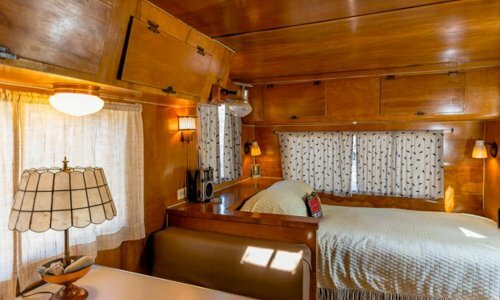 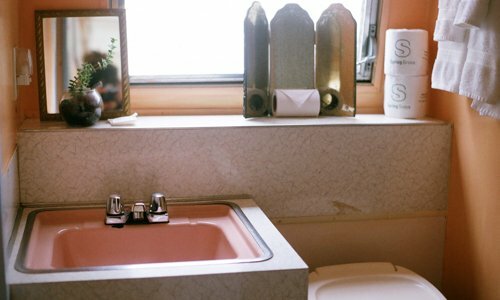 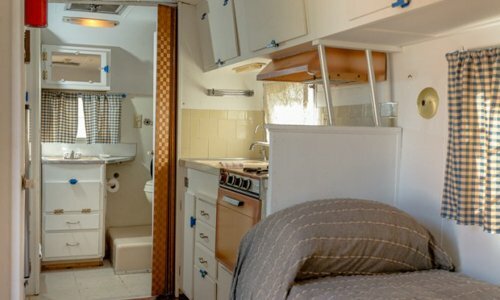 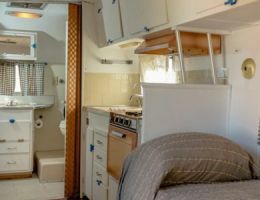 The Royal Mansion is a classic gem among Vintage Travel Trailers. 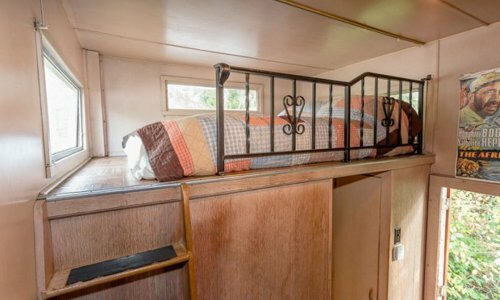 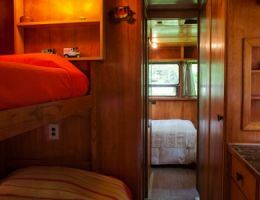 It’s a 1953 family-sized Spartan with a full-sized bed in the back bedroom and two twin-bunks in the “second bedroom” (aka, a hallway). 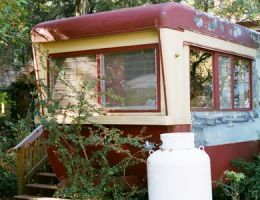 There are twin pendulum globe lights hanging in a curved, oversized front window that make this trailer a delight to approach in the evening. 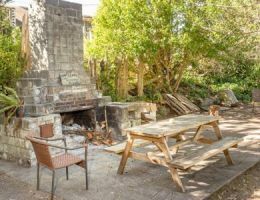 It is west facing and conveniently located in the inner trailer court adjacent to the main Lodge, picnic tables, and fire pits. 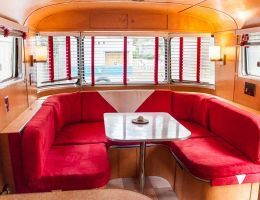 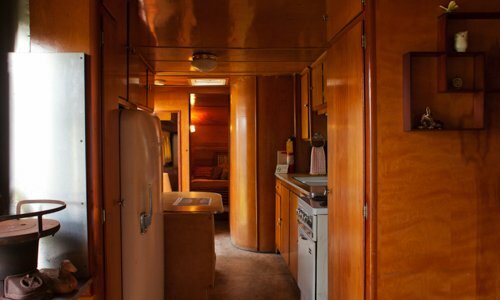 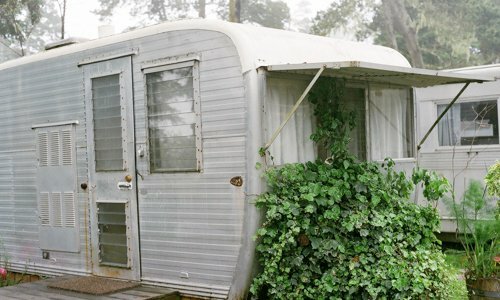 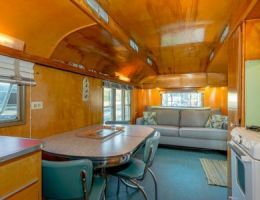 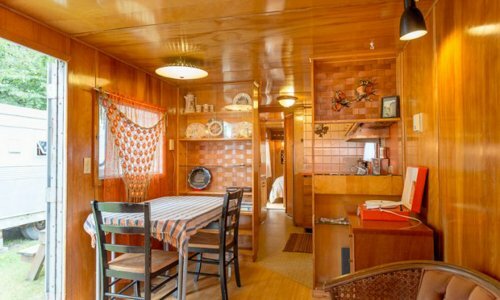 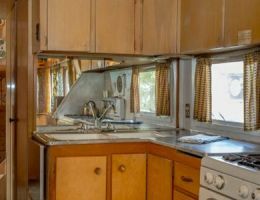 The Imperial Spartan Mansion is a deluxe family-sized 1953 Vintage Travel Trailer. 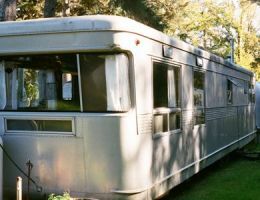 Measuring 40’, it’s the longest on the property! 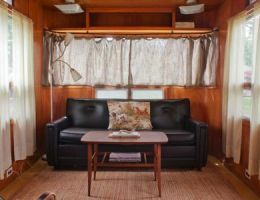 The front of the trailer has a living room with a couch and table seating – great for hanging out, playing games or having a meal. 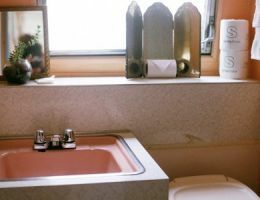 A special feature just outside the master bedroom is a freestanding sink and vanity separate from the bathroom. 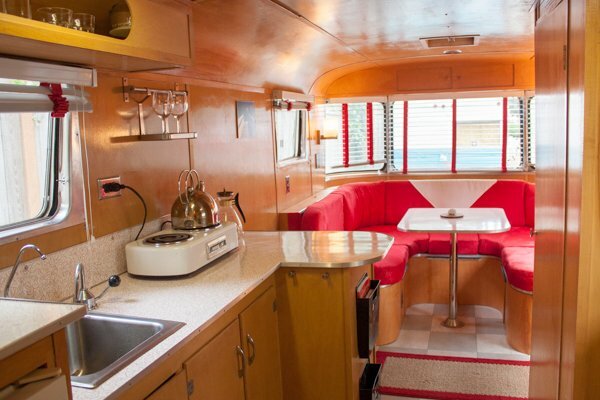 Great for a bachelorette party! 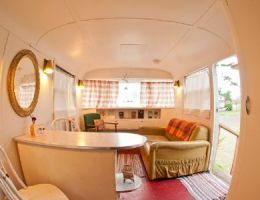 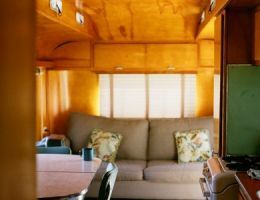 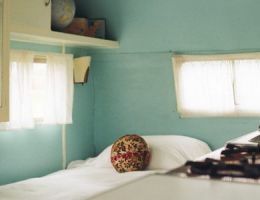 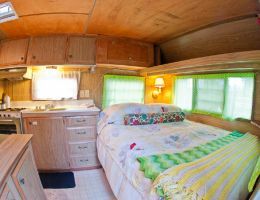 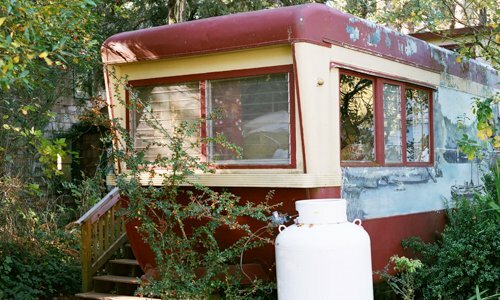 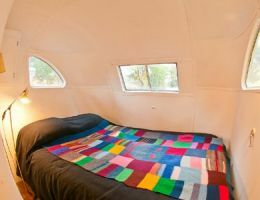 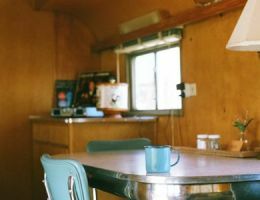 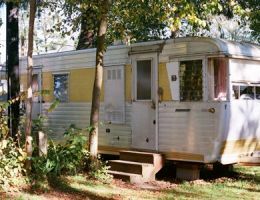 The Vagabond is a 1950 Vintage Travel Trailer that came all the way from Iowa to be resurrected to its’ former glory! 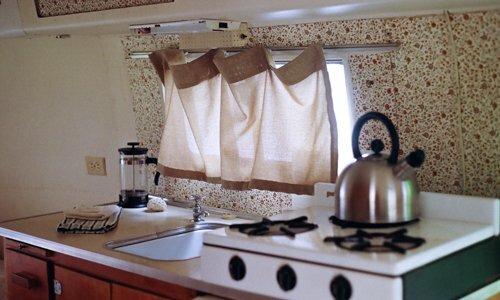 The lower valance was rebuilt from aluminum and custom bent birchwood to replicate the original curved corners. 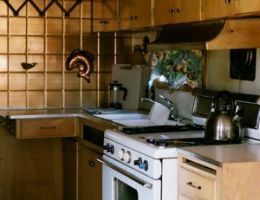 The interior has almost every surface replaced or restored to mimic the “cabin in the woods” feel. 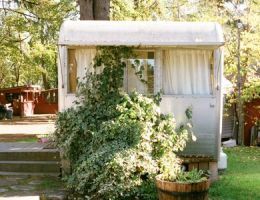 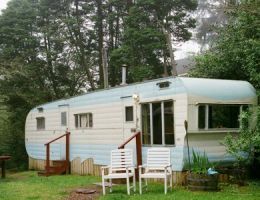 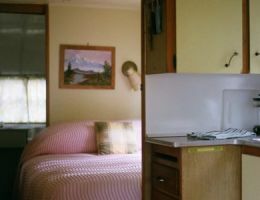 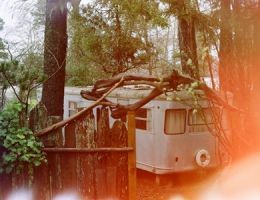 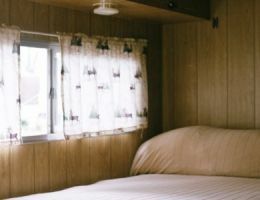 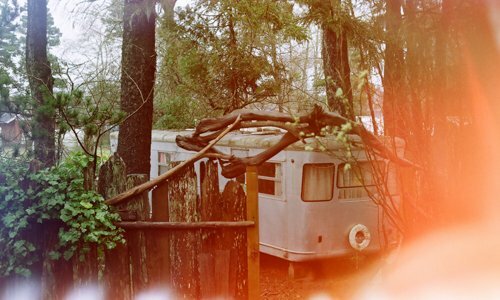 Wander to the Sou’wester in true vagabond-style and stay in this family-style trailer with a group. 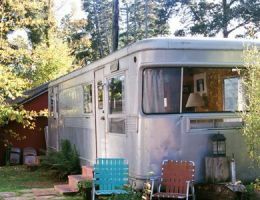 The one and only big mama that sleeps 6 adults! 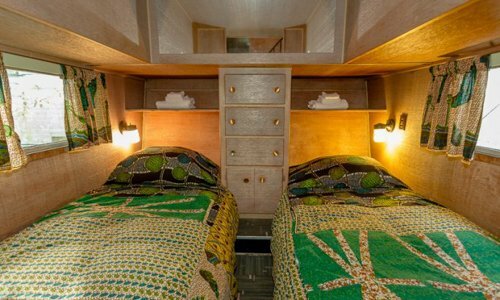 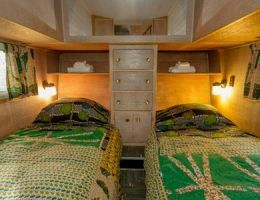 The African Queen is an extremely popular tri-level 1953 Vintage Travel Trailer. 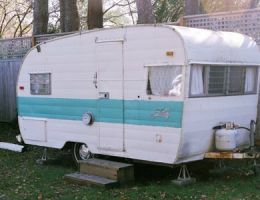 It is the only one in our Deluxe Trailer collection. 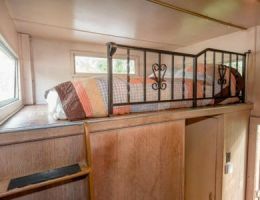 The first floor has two single beds, the second floor has a master bedroom with a full-size bed, and the third-floor platform has a loft-style full size bed accessed by ladder. 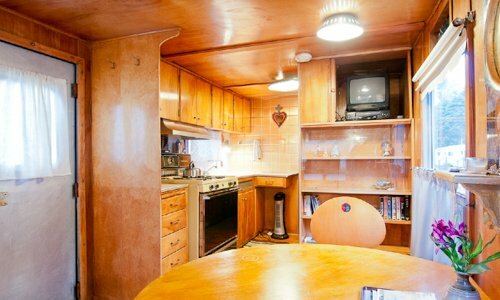 The spacious kitchen and dining room is great for a group or family gathering. 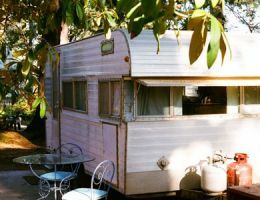 Nestled in the corner of the inner trailer court, close to the fire pits. 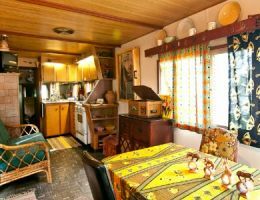 Quite the site to see, this mammoth trailer is decorated with a wild array of African art made from recycled materials. 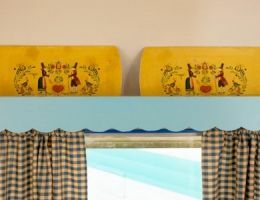 Kids love it here!